Garmin Full Coverage TOPO U.S. 100K Micro SD Card. $99.99. "I have been very satisfied with the product and your company." Steve, I have not had a chance to use it yet, but my son has the same system, and he likes it as well as me. Can't wait until bear chase season begins, which is not until Sept., so I can use it. Thanks for asking. I have been very satisfied with the product and your company. The map is excellent. It should have the road names marked for wma. It gets confusing when the dogs are running through blocks. There's a lot of information on this map, and you need to scroll in to see the location of your dogs. Therefore, you lose a lot of the features. Scrolling out gives a great picture of what is around you. "I would recommend it to other customers." The Garmin Topo Map takes my Garmin Astro to another level as a tracking device. I am able to track my dog even on the worst nights and enables me to drive closer to my dog (the map shows dirt roads and even unnamed roads) or go around obstacles to get to her. The only thing I think needs improvement is the map could show more detail for creeks and swamps. It is a very good product though. I would recommend it to other customers. Requires the latest software update for your Garmin. See if yours is up to date with Garmin WebUpdater. Includes full coverage of the United States, including Alaska, Hawaii and Puerto Rico. The TOPO U.S. 100K full coverage data card includes the same great features and mapping data as our 11 regionalized data cards. It contains interactive views of detailed topographic maps and land elevation contours with elevation shading on compatible units. It is vector-based and contains descriptive details for features typically found in topographic maps, such as terrain contours, topo elevations, summits, parks, coastlines, rivers, lakes and geographical points. With TOPO U.S. 100K, you can have topographic detail wherever your journey takes you. Just plug the data card into your compatible unit and see the entire United States. 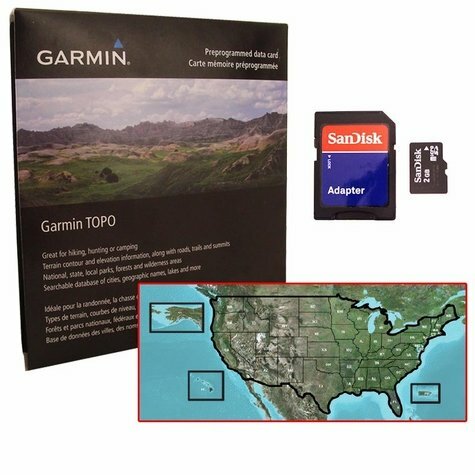 Preprogrammed microSD cards -- Their compact, small size makes it easy to pack light and add maps to your Garmin Alpha or Astro GPS or other compatible unit. Just plug these cards into your GPS, and you're ready for the great outdoors. Loaded with detail, including terrain contours, elevation information, trails, summits, rivers, lakes and some roads, these cards are perfect for your next outing!